2K Sports gave out its player ratings today for NHL 2K10 and, fun-with-spreadsheets style, we present you this year's superlatives - dubious included - among the 1,225 players on this year's roster. • Best Player: Evgeni Malkin, center for the Pittsburgh Penguins is a 98. Behind him is teammate Sidney Crosby at 97, no wonder they won the Cup, eh? 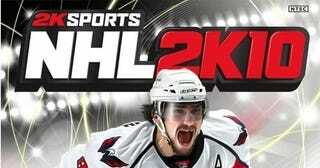 Also a 97 is coverboy Alex Ovechkin. • Worst NHL player(not a free agent or minor leaguer): Philippe Dupuis and Matt Halischuk are both 60s and on the regular roster for Colorado and New Jersey, respectively. • Best goalie: Roberto Luongo of Vancouver is a 94; ageless future hall-of-famer Martin Brodeur is second-best at 93. • Best Defenseman: Zdeno Chara of the Bruins is a 96; Mike Green of Washington is rated behind him as the best offensive defensemen, 93 overall. • Fastest Player: Mason Raymond of the Vancouver Canucks is rated a 98 in speed. • Slowest Player (non-Goalie, non-free agent, on a roster): Derek Boogaard, left wing for the Minnesota Wild is rated a 55. • Best Fighting Goalie: Dan Cloutier, a free agent, has an 84 rating. Ray Emery, of the Philadelphia Flyers, is an 81, best of any goaltender on a roster. • Most Valuable Goon: (Highest fighting, highest overall in the enforcer classification): No question, Donald Brashear of the New York Rangers. 98 fighting, 76 overall. Georges Laraque of the Montreal Canadiens has a 99 fighting but is 74 overall. • Worst Goon: (Lowest fighting, enforcer classification): Free agent Jeff Cowan and Brandon Prust of the Calgary Flames are both 70s.